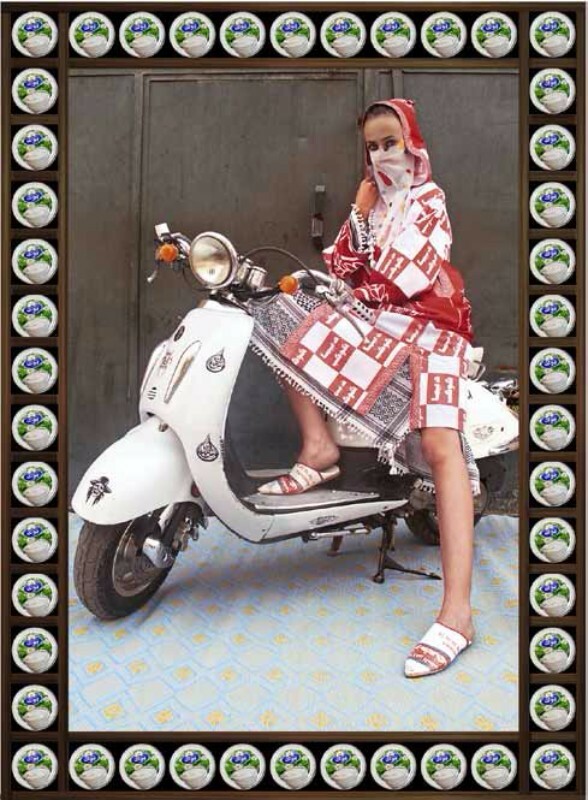 Some say photography is performance, and there is certainly a performative quality to Hassan Hajjaj’s work - staged in diverse patterns and complementary colors that somehow sing in reference to one another. His vibrant color palette evokes a musicality and irony - irony told through themes of colonialism and the globalization of consumerism. We’ve been building up homogenous capitalism for decades. Batik warehouses in Nigeria are replaced by oil rigs, cloth specific to the rich textile history of the Congo gets lost in the hunt for jobs in the gold mines. Craft, knowledge, culture and heritage are lost in the search for a living wage. Commodities themselves become the frames to Hajjaj’s photographs. They clash, fuse and drum in rhythmic, color-defining territories that seek to also frame the history of colonialism. Hajjaj uses textiles to symbolize the labor market, pushing the viewer to think about the ongoing shift of labor from the craft to the mining industries. He places popular consumerist products in the frames of his Kesh Angels series to create a dialogue with the viewer. His subjects are layered with codes and references to modern day colonialism: Nike shoes framed by Arabic text; a man with his back to us with Arabic text surrounded by Sprite cans. Hajjaj’s work draws on the tradition of African portrait photographers Seydou Keïta and Malik Sidibe, those renowned documenters of postcolonial style and culture (he worked under each of them as an apprentice). He pays homage to them with symbols like a motorbike or a pair of heart shaped glasses, and with the use of pattern, but also through his messaging. Hajjaj was one of twenty artists featured in a recent exhibit at LACMA called Islamic Art Now: Contemporary Art of the Middle East (curated by Linda Komaroff). For an extensive survey of Islamic Art, this massive geographical area with so many cultural traditions and complex histories, Komaroff was given one of the smallest gallery spaces in the Museum. So beyond questioning the legacy of our colonial history, Hajjaj’s photographs begin to question how we represent culture in western institutions. A recent study by Julia Halperin for The Art Newspaper found that found that nearly one third of solo shows in US Museums go to artists represented by just five galleries: Gagosian, Pace, Marian Goodman, David Zwirner and Hauser & Wirth. So who controls representation? Which artists get play in American museums? Which cultures? How is the commercialization of the art world replicating old assumptions and patterns for a broader public? Are we back to Orientalism, where artists of the ‘other’ are sidelined? And do the artists who were selected to exhibit at LACMA, for example, simply become examples of “the exotic” for a western lens? American museums have a responsibility to heighten awareness and broaden our understanding of Arabic culture at In this moment of global crisis, artists and curators need support from institutions, not reductivism. American museums have a responsibility to heighten awareness and broaden understanding of other cultures, not pigeonhole them. In his work currently on display at The Wexner Center at Ohio State University, Hajjaj has remixed his photographs, turning them to performance videos, filled with his friends from around the world. He’s mixing music, mixing traditions, mixing tastes. Roberta Smith, art critic for the New York Times, has referred to his works as ‘transcultural documents.’ His images are a melting pot of our mass of cultural identities, framing and reframing the complexity of how we live now. 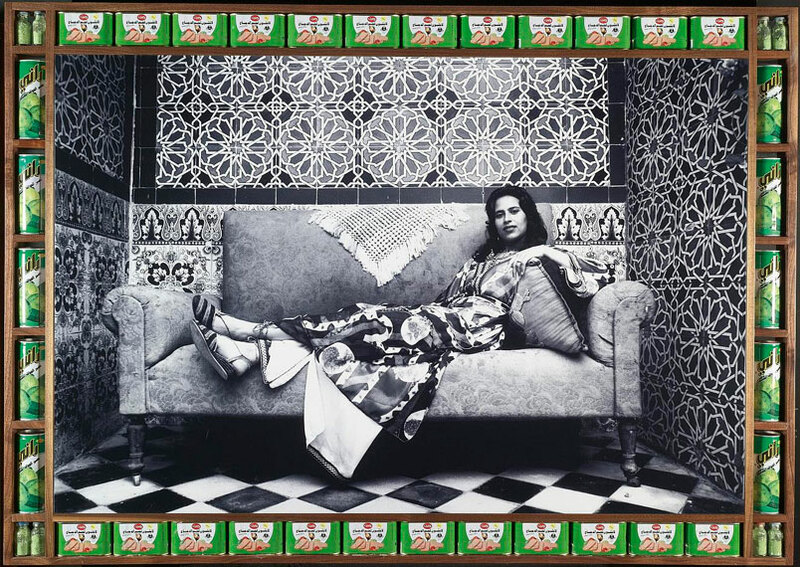 Hajjaj’s work stands strong, with dignity, defying western interpretation and marginalization.